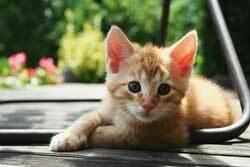 Great cat names beginning with the letter Z. This is the name of a girl in the book "Loch." Because it was different and it suits him well . 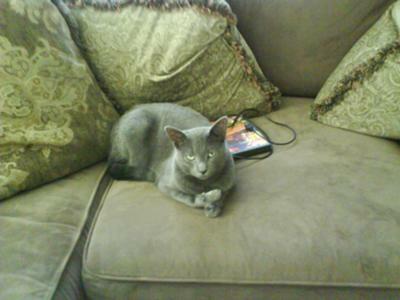 Zeus is a beautiful (but BIG) gray cat--as soft and cuddly as you could ever want. My boyfriend was looking for an orange kitten for me, and Zeus came up to him and started rubbing against his leg and purring. That's all it took for my boyfriend to bring home both kittens. We changed his name from Earl Gray to Zeus because he's so big. i like the greek myths and it is a strong sounding name. he is the only boy in the house. I love lazytown and it is a cute name. Because it rimes with my old cats name Tiggy. Very peaceful! I love Zion! Its a very strong name too and perfect for a noble cat. Naming a cat can be such a personal thing. when I was rowing up we tended to o for cutesy names but now i go for names full of character and individuality. This name is one of those. This must be an American character as i have never heard of him before. here in England Zippy is a puppet on the kids program Rainbow. Does your cat have a small head then? It has a "don't mess with me" demeanor - like Ziva on the NCIS television series. Zoe means "life". 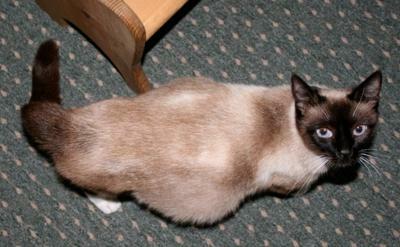 She was 6 weeks pregnant when we rescued this beautiful Siamese off the street. She brought life to 7 kittens and we gave her a new life with us, along with 2 of her kittens. I think its a beautiful name and my little girl deserves a nice name.she is a spunky girl,i got her from the spca,her name there was star,which i 'm keeping too,although she doesnt really know.she is a black beauty,so therefore she needs a beautiful name.